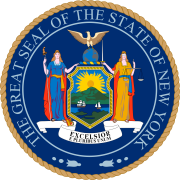 The New York Attorney General election of 2010 took place on November 2, 2010. Democratic State Senator Eric Schneiderman beat his Republican opponent Daniel M. Donovan, Jr. to win the post of New York State Attorney General, which had been vacated by Andrew Cuomo following his run for governor. This page was last edited on 29 January 2019, at 23:58 (UTC).